Forget about carrying heavy lighting rigs when performing outdoor photography sessions. This Gloxy Power Blade Continuous LED Light provides continuous light without any flash, ideal for fill light or to create light painting. The Power Blade will provide light for up to 10 hours and even if it runs low you don´t have to worry since it includes a charger for home and car use. 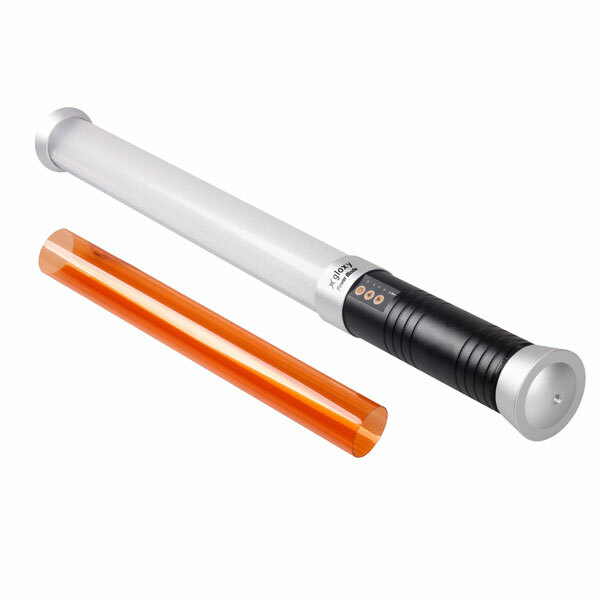 The Gloxy Power Blade Continuous LED Light also includes an orange filter to get ideal temperature colours, a remote control is included and a charger. It also connects to a tripod/light stand via a 1/4" thread . With the Gloxy Power Blade Continuous LED Light you no longer need fill flashguns. During the day the Gloxy Power Blade Continuous LED Light provides the function of a flash or a reflector; at night you can light your scene and work with full visibility. Weighs only 620g weight, so is a great product for 'light painting'. Composed of 298 LEDs, it guarantees between 1 and 10 hours of light (depending on the intensity) and a range up to 50 meters. Connect the Gloxy Power Blade Continuous LED Light to a tripod via a 1/4" thread. Includes an orange filter so you can change the colour temperature to your liking, a wireless controller and a battery charger. The Gloxy Power Blade Continuous LED Light Continuous light provides great control when using the light in studio photography. Together with the Gloxy Power Blade Continuous LED Light you will find a remote control, a battery charger and orange filter to change the colour temperature.